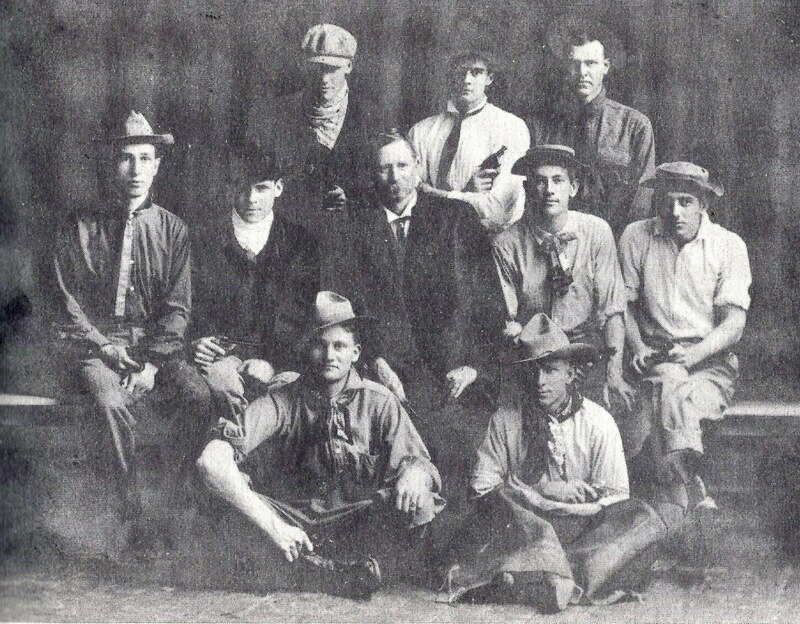 Dean Thomas Taylor (center), and the nine “Taylor’s Bandits” unmasked. Yes, each of those UT students is brandishing a six-shooter. Click on the image for a larger view. Engineering Dean Thomas Taylor was in serious trouble. It was a balmy spring evening, April 1, 1913, when the UT faculty gathered at 8 p.m. for their monthly dinner. A mostly-social event, it was held at the University Faculty Club in the YMCA building, next to campus on Guadalupe Street. The professors from each academic department took turns as hosts, and were responsible for the evening’s entertainment. It might include a musical performance or skit by the host faculty, a special lecture, or a debate. This particular evening, it was the law department’s turn, but the professors had devised something rather sinister: they hoped to hold a surprise kangaroo court against engineering dean Thomas Taylor. April 1st is a special day for UT engineers. Since 1908, the day has been reserved for tribute to Alexander Frederick Claire – or “Alec” for short – patron saint of Texas engineering students and alumni. Students “permanently borrowed” a wooden statue from a local beer garden, declared it to be the likeness of their beloved Alec, paraded the figure around the campus, swore allegiance on holy calculus books, and cut classes for the rest of the day. For over two decades, the ceremony was repeated. Today, the Cockrell School of Engineering continues to remember Alec on the first day of April, and the patron saint is on display in the engineering library. 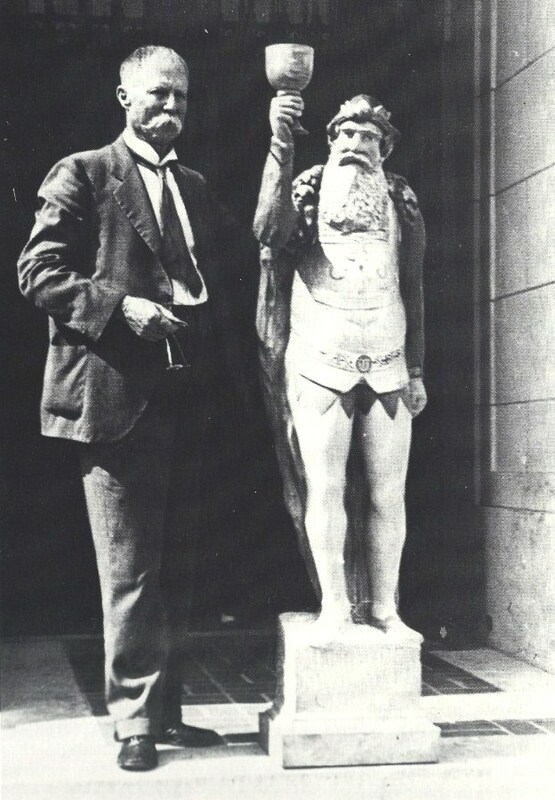 Above left: Dean Thomas Taylor with engineering patron saint Alec. The law and engineering departments were longtime, mostly-friendly rivals, and the 1913 law professors saw the date as a ripe opportunity. They planned to have the red-haired dean stand trial for some vagrancy (just being an engineer was a criminal offense, in the eyes of the law department), and once convicted, the “culprit” Taylor would be assessed a dinner for the law faculty at the dean’s expense. As bailiff, the lawyers recruited Dr. Charles Ramsdell, a first-year member of the history faculty from Columbia University, whose youth, height, size, and strength was thought to be sufficient to retain the dean, should he have any thoughts about leaving the proceedings early. Just a few hours before dinnertime, Taylor was tipped-off to the dastardly plans, and quickly arranged for a group of nine trusted engineering students – later dubbed “Taylor’s Bandits” – to come to his rescue at the appropriate time. As the dinner began, there was a general feeling of pleasant anticipation among the law faculty. But the grapevine had been busy. The engineering professors possessed a similar mood, but for an entirely different reason. Just as the main courses had been finished and dessert was to be served, the kangaroo court was sprung, and the bailiff ordered to take Dean Taylor into custody. But a pre-arranged signal from Taylor brought his masked bandits screaming into the room from their hideout in the kitchen. All were armed with actual six-shooters (loaded with blanks! ), and the “courtroom” was suddenly filled with yelling, the loud pops of gunfire, gun smoke, and utter confusion. Dean Taylor was hustled out of the dining room. Bailiff Ramsdell tried to retain his charge, but was no match for the rowdy bandits. Taylor was led out the back door, taken directly to the downtown train station at Third Street and Congress Avenue, and, taking no chances on his escape, was put on an evening train bound for San Antonio. A few days later, Dean Taylor did indeed host a dinner at his expense, but it was for his faithful bandits. The chagrined law professors, their plans foiled, weren’t invited. This entry was posted in Uncategorized and tagged Alec, Engineering, Jim Nicar, Taylor, Thomas by jimnicar. Bookmark the permalink. Great story. I’d love to share this with my uncle, the only UT engineer in our family — but he uses neither Facebook or Twitter (to my knowledge). I’m not the most computer-literate fellow either, so please tell me how I can forward this to my uncle through our “regular” att.yahoo email. Many thanks, Jim!